Eric Trump, left, and his brother Donald Trump Jr. talk at the opening of a Trump Golf Links clubhouse, Monday, June 11, 2018, in the Bronx borough of New York. President Donald Trump's two adult sons are cutting the ribbon on a clubhouse at the Trump Golf Links in the Bronx on Monday with hopes it will attract more visitors. Data from the city obtained in a Freedom of Information request by The Associated Press show revenue at the course fell 7 percent last year versus the year earlier. 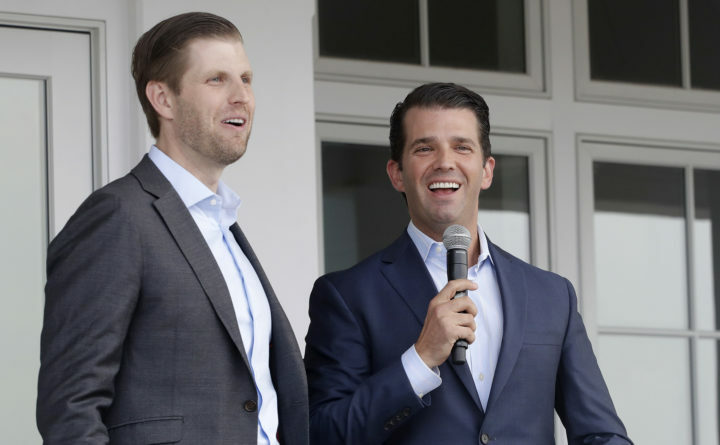 NEW YORK — Eric Trump cut the ribbon on a new clubhouse at a golf course on Monday and said his family’s golf empire is doing “spectacularly,” but the few public numbers available suggest tough times in the second year of his father’s presidency. Trump and his brother Donald Trump Jr. opened the clubhouse to cheers at the Trump Golf Links at Ferry Point in the Bronx after arriving by the Trump helicopter near the 18th hole. They hope the new building that replaced a temporary tent at the 3-year-old course will boost its fortunes. Data from New York City obtained in a Freedom of Information request by The Associated Press show revenue at the city-owned course in the shadow of the Whitestone Bridge fell 7 percent last year, echoing some disappointing figures at other Trump resorts. But just how Trump’s golf business in general is faring is difficult to tell, given that the company is private. The Trump Organization has made a big bet on golf in the past decade, spending more than a billion dollars buying and developing courses it owns, licenses or manages at 17 resorts around the world, including ones in Dubai, Scotland and Ireland. The Trump Organization’s golf courses generated $221 million in revenue last year, according to the president’s latest financial disclosure report. A comparable figure from the year earlier is unavailable, and Eric Trump wouldn’t give any numbers. The second-oldest son of the president said one of the company’s biggest courses — the Doral in Miami, which generated $75 million in revenue last year — is doing especially well. “The Doral is on fire,” he said. The few publicly available figures paint a mixed picture of the business. Greens fees fell last year at Trump’s Los Angeles course, and his two Scottish resorts and one in Ireland posted losses in 2016, the latest year available. One of the Scottish courses and the Irish resort were at various times closed for business, so the numbers are not directly comparable to the year earlier. Eric Trump said the 2017 figures for the Scottish and Irish properties show vast improvement, though he would not elaborate. “The courses are doing fantastic,” he said. Joining the Trump brothers at the Bronx clubhouse ceremony was golf legend Jack Nicklaus, who designed the links course, which was built on the site of a former garbage dump. Nicklaus told the Trump brothers he was frustrated with the slow progress of developing the course nearly two decades ago but then Donald Trump got involved. Some in the crowd had a different opinion. Stefan Greenberg, who dropped by the ceremony before hitting the links, said he likes the course because there are so few people there.